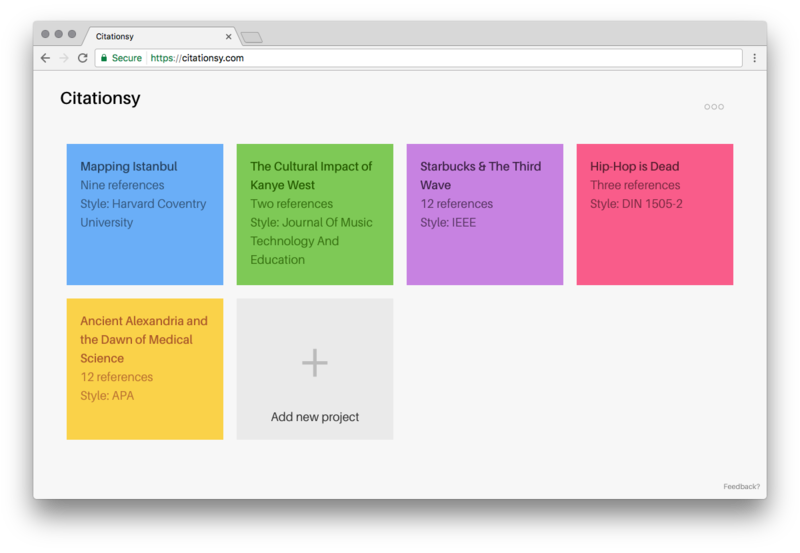 For those of you who only just signed up for Citationsy, this is the third edition of the weekly Citationsy newsletter highlighting changes and updates I’ve made and reaching out to the community. If you don’t want to receive these emails, simply click the link at the very bottom to opt out. You can read the first two emails here. I spent most of the week going down the rabbit hole of trying to fix a particularly annoying bug with the rendering of References where not adding an author would lead to the title being repeated. It looks like I’ve finally found a solution, but keep an eye out for weird bugs and let me know — You know I love feedback. Speaking of which, I added a little “Feedback” button to the site, clicking it will open up a form that will let you contact me by filling in just one field and clicking a single button. Easy-Peasy! I did some work on the project view, updating things here and there and making everything full-width. Some buttons have moved around, but everything’s still there. Thank you for being a customer, and as always: email me anytime (cenk@citationsy.com) with feedback or if you need help with anything. PS: I finally added the ability to rename projects. Deletion coming soon. PPS: I also fixed a problem with YouTube referencing. If you tried to cite a YouTube video in the past give it another try, it should find all the information right away now.